I’ve spent a substantial amount of my career thus far performing due diligence. While there is a legal definition of due diligence, I tend to use it most in reference to decisions around investment in assets. I’ve always been attracted to the decision making around whether or not to allocate capital, and I’ve seen a variety of decision making processes across different asset classes and decision types. While I was an undergraduate, I played online poker part-time to pay for school, and continued playing after graduation to provide supplemental income. 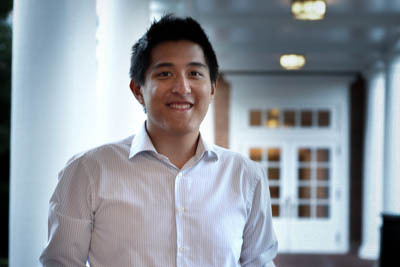 After graduation and working as a process engineer and project manager for a period of time, I shifted to the business development side and worked on negotiating a joint venture in China, including performing both the financial and technical diligence. Since then, I’ve worked in venture capital and in private equity consulting performing commercial due diligence – primarily assessing product-market fit, market growth and size, and competitive positioning. Due diligence varies substantially across asset classes, and I believe that different investors are better or worse suited for investment in different assets based on how characteristics of asset class decisions match an individual’s personal preferences. To analyze poker as an asset class, I will first layout my overall framework and analyze the decision characteristics of poker against that framework. I’ll end with analysis of the due diligence I performed in poker, and discuss the typical investor traits necessary to be successful in poker. My analysis will center on Texas Hold’Em since this was the game I played the most, and the game most familiar to most people. Most of the numbers referenced are from my own recollection of approximately 750k hands played in my early 20s. Graphs and figures come from a more recent set of ~150k hands played part-time during my MBA. Poker exhibits a few small outcomes very frequently and many extreme outcomes very infrequently. It also exhibits both positive AND negative power law behavior. Due to the extremity of outcomes, it’s difficult to tell from this picture alone whether these are outcomes of a winning player. Below is what the outcomes in the above chart look like over time, and not as a histogram. Length of Decision Impact: The effects of a decision in poker could be felt for a very long time if you are playing riskily and for example putting your entire bankroll on the table. For most poker professionals, the impact is close to 0 seconds assuming they are following appropriate bankroll management and not putting a substantial portion of their bankroll on the line. This contrasts strongly with asset classes like private equity and venture capital, where the impact of decisions are extremely long, and you must live with an investment decision for 5+ years. Thus, there is low decision uniqueness for a large percentage of decisions (such as deciding whether to fold a hand before the flop). However, there is extremely high decision uniqueness for a small percentage of decisions, that also tend to be for very high stakes. This bifurcation of decision uniqueness isn’t completely unique to poker – a reasonable comparison might be a venture capital firm specializing in online marketplaces. This firm sees high decision uniqueness in individual deals with different founders, products, etc., but low decision uniqueness across the body of the investments they look at, which are all online marketplaces. Stakeholders: Poker is a negative sum game, where the house takes a rake and you play against other players. To break even, you must be better than average in the field to win money from other players. No matter what, someone is losing. As a result, poker tends to be a very individual game. The closest players come to having a team dynamic are through networks of poker player in forums, Skype groups, and real life relationships built to analyze hands, mutually improve performance, and diffuse emotional stress from the variance of the game. Accessibility to the Public: Live poker is relatively accessible for Americans over the age of 18 near a casino. Online poker has been inaccessible in the U.S. since the UIGEA was passed in 2006. This substantially limited the ability of many poker pros to continue their careers and caused many to leave the country or seek other employment. Ownership of Outcomes: Some professional players sell pieces of their play (essentially equity in the outcome of the session) to help lower variance/risk. Outside of these scenarios, poker players are generally playing from their own bankroll similar to a proprietary trader. Due diligence in poker varies substantially by player – many fish never really think critically about their decision making, while poker pros might pore over a hand for days or weeks. The standard for most poker pros is to balance their time between both playing the game, and studying the game. This means that a very large fraction of hands end up having little to no analysis performed. 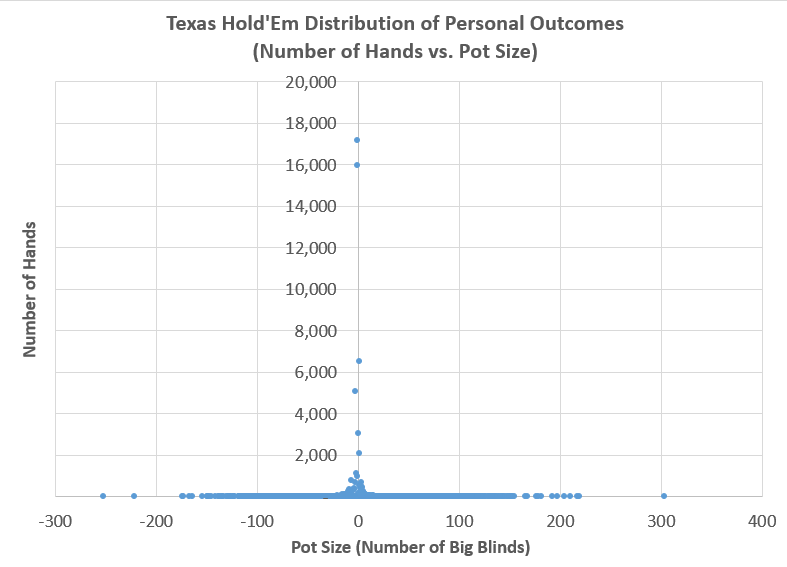 The combination of the fact that outcomes are power law and decision uniqueness is both low for starting hands and high for hand outcomes informs much of how the game is analyzed. The study of poker itself tends to be bifurcated, with some time dedicated to in-depth analysis of individual hands with large outcomes, and other time spent on analyzing overall game theory that affects the long tail of low decision uniqueness hands. Because poker has extreme outcomes and high decision uniqueness, it’s frequently difficult to identify concrete right and wrong answers in detailed hand analysis. As a result, a common mantra heard among poker pros is to not be results oriented. Substantial effort is made to achieve a focus on the decision making process itself, such that results are not provided upfront in the problem statement, in much the same way that business school cases tend to hold back the result until after the case. Edges in online poker are small and getting smaller, so winning players are pushing to make 1% more decisions correctly. I recall a thread that appeared once on Two Plus Two, the online forum where the best poker players congregated a decade ago, in which many players posted results of a Myers Briggs personality test. Easily 90% of the players tested as some variation of INTJ or INTP. At the end of the day, online poker is a game that rewards the same skills that proprietary and high frequency trading firms select for: high analytical logic, comfort with ambiguity, and high risk tolerance. Although there are certainly shared decision characteristics between poker and more risky asset classes such as venture capital, they are different enough that diligence and investor traits are substantially different. 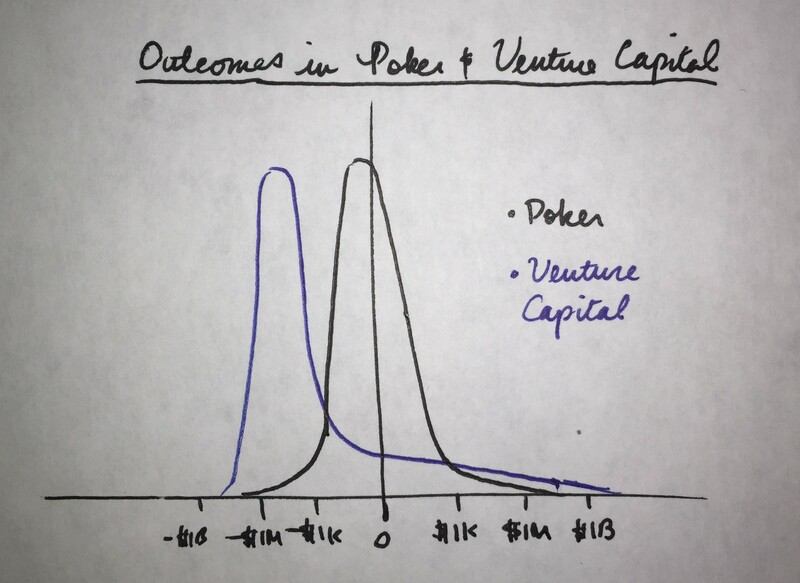 A major difference in decision criteria that emerges immediately: while poker, trading, and venture capital all exhibit power law returns, venture capital does not exhibit negative power law returns while poker and trading exhibit both positive and negative power law returns. These nuances and more next week, when I analyze due diligence and investor traits in venture capital.